Class Tech Tips: ARBasketball: Must See to Believe! Their picture came out better than mine! 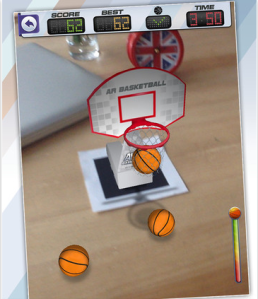 I’ve shared some apps that seem too good to be true and ARBasketball – Augmented Reality Basketball Game is definitely one of them. AR stands for Augmented Reality, and that’s where the basketball hoop comes in. Download the app to your iPad, print out the PDF file on their website and hold your iPad over the piece of paper. A virtual basketball hoop will pop off the page and you can shoot baskets straight from your iPad. Whether you’re teaching probability or addition, or just looking to wow your crowd, AR Basketball is an app you need to see to believe!